Since 2012 I am harping on the point that Congress could easily be the most ill-advised political party in India, and they never miss an opportunity to prove me right. Ever since Modi came into power the hara-kiri of Congress as a party and Rahul Gandhi in particular have crossed some bizarre proportions. They are kind of legendary. Every new day brings a more immature and confused Congress into the fore. Most in their party leadership have turned into some kind of national ridicule in one form or the other. For long even their party president Rahul Gandhi’s IQ has become a national joke. They are simply clueless on how to resurrect their lost fortune and foothold in Indian political discourse. They now are desperate to find a medium to elevate their present precarious situation as a political party. Doesn’t matter if the medium assures some sanity or not. A classic case of ‘Dubne Wale Ko Tinke Ka Sahara’ situation. They are so desperate that they are ready to crawl towards a mirage, and when they find it is not water, they drink the sand. One such mirage hunting was an attempt at calling the ‘no-confidence’ motion against the Modi Sarkar. Yet again they transcript themselves to a national joke at the end of the day. But does the damage limits only to them being rendered a national joke, which they anyway are? I am afraid, to their utter despair, the damage is far reaching than just memes and jokes on social media. Let’s see. You don’t need Ramachandra Guha’s political acumen to realize that BJP enjoys a comfortable majority in the house. It is simply inconceivable to imagine that you can topple the government by flying kites. So who advised Congress to try this misadventure is still a mystery. The Pidis around the circuit might make you believe that Congress was trying to earn some political brownie points with this mischievous and stupid political maneuver but that is far from being the fact. Bargaining for outright humiliation when it was totally unnecessary is certainly not the smartest thing to do. But Congress being the Congress, they readily agreed to be humiliated because of their own foolish doings. During the budget session an overzealous TDP brought the no-confidence motion on the floor. The request was rightfully rejected by the chair as there was more nonsensical quotient than substance in the move. But this over evident fact evaded the desperate. They marched down the city center howling how BJP is afraid of testing their own strength on the floor. The Pidis joined the chorus too. 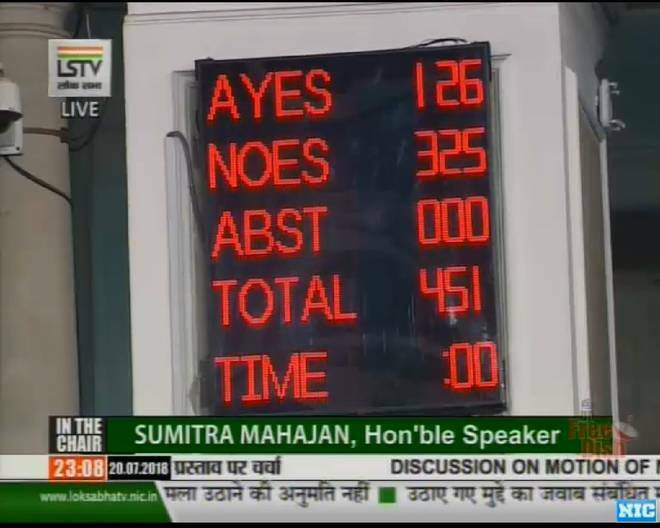 In hindsight the Congress and other assorted losers should have been thankful to the chair that their demand to be humiliated in open was rejected. But fools learn the hard way, or for that matter, they never learn at all. Come the hour, come the fools again – they demanded floor test yet again at the start of the Monsoon session. I can understand the idea behind such foolishness but was it worth an idea to begin with? The recent war cry of ‘Mahagathbandhan’ is one thing but attempting suicide twice in as many moths is plain stupidity. Congress knew very well that they can’t overthrow the government with such childish act. What they thought, they have a win-win situation either way. By bringing the government to address the no-confidence motion, they would assert the strength of the ‘Mahagathbandhan’ which they pledged during Kumaraswamy’s oath taking ceremony. But the overwhelming belief was that the chair would reject their request once again. That would give them another opportunity to walk to the city center along with their Pidis shouting – democracy in danger. But this time their bluff was called out. To surprise even the clowns themselves, Mrs. Mahajan accepted the move. They were caught in their own game and were all over the place like headless chickens. They walked into the trap and this is precisely why I call them ill-advised. What followed was a mass wastage of public money. Entire day was wasted on a farce while it could have been utilized better. Most speakers kept on whining the same age old rubbish which the populace has rejected savagely time and again. Didn’t I say – fools never learn at all? TDP, which has moved the motion, had its speaker ranting for one full hour. Absolute garbage. Other speakers weren’t any better. They too delivered rubbish without a drop of sweat. But the cake of the session was stolen away by, who else; Rahul Gandhi. Cartoonists seldom miss the fact in the cacophony. And trust Amul to bring the best in the most humorous manner. Nobody knows what Rahul Gandhi was up to yesterday, not even himself. No one knows what he was trying to convey, if at all we can call his ranting as making your point heard. But then, that is the hallmark of RG anyway – clueless. He spoke for 20 minutes straight and as expected made no sense at all. I didn’t get a single point in his entire blabber that could have highlighted the reason/s for his party’s call for no confidence. Everything he spoke was the usual gibberish. Thankfully he didn’t go around his ‘Maa-Baap-Daadi’ nonsense but trust me, he wasn’t far from that. If anyone, his speech writer must be shown the door for good. More than the motion he spoke about himself and his party that no one believes anymore. To end his pedestrian deleverage he went ahead and hugged the PM. I am sure this hug part can’t be his idea. He simply is incapable of thinking that far. Ill-advised again? On plain decorum ground his act was highly uncalled for. Why sudden affection for someone whom you despise as much one possibly can? This is laughable to say the least. That said, if you ask me – well I don’t see much problem in RG’s hug. Apart from being the PM, Modi is a very senior politician, and I don’t see any harm in exchanging affectionate hugs with our PM. That is absolutely fine. But was it a hug out of affection? Certainly not. Not if you notice the actions of RG once he was back on his seat. He winked wickedly at someone as if he did something as planned. What message was he trying to pass through his wink? This reflects his callousness and dishonesty. He wasn’t genuine to what he was saying, including his pledge of love for everyone including the PM. He was bluffing. As Amul cartoon depicted – it was embarrassing. This is why I always maintain – RG is even unfit for the position that he is currently holding, let alone the post of PM. He is unfit not only because he is too immature to his age but also his dishonesty towards everything he does or says. At the age of 48 he lacks many basic traits of a mature and grown up human being. At the age of 48 he is still learning the basics. It is a crude way (as shown in the picture) to summarize RG’s speech but I won’t disagree with what Kapil Mishra tweeted. Mistakes once or twice is fine, everybody commits. We can let go occasional mistakes made out unintentionally. But RG is a routine offender. His mistakes in the past were more intentional than otherwise. Add to that his arrogance and nonchalance towards the core norms of everything, not just politics, creates a potent mixture that we know by Rahul Gandhi. Mistakes and stupidity go in toto with Rahul Gandhi. He can’t be spared of his gaffes always. Someone has to call it out, and I am glad Kapil Mishra did it. As I said KM was little crude in his outburst but unpleasant truth nonetheless. RG was just part of the casualty yesterday. The biggest casualty was how the ‘Mahagathbandhan’ fell apart. Numbers don’t lie. NDA garnered 325 votes, 10 more than their tally of 2014. Add the absenties and some ex allies of BJP, the number would very well go past 370. Is this a no-confidence on the government? In fact, it appears the no-confidence motion turned out to be an add-confidence motion for BJP while the entire gang of ‘Mahagathbandhan’ looked more foolish than a bunch of doorknobs. The major cohorts in the motion, UPA-64, TMC-34, TDP-16, Left-11, SP-7, AAP-4, AIUDF-3, JDS-AIMIM-JKNC-PDP-RLD 1 each; total around 144 seats. But it seems they even failed to flock their own unit together. They just got 126 votes. There were 18 members of their own who found this no confidence motion a nonsense and reposed their faith on the Modi Sarkar. Hilarious!! These are some worrisome signs for RG and ‘Mahagathbandhan’. I am not sure if RG would understand the fallacies but I expect at least others in the ‘Mahagathbandhan’ understand how miserable the failure was. Perhaps why RJD was very critical after the voting numbers came out. This is how fools make bigger fools of themselves without any provocation. Not that 2019 was going to be easier for them in any manner than what 2014 was, and yet, they give handles to Modi and BJP to kick start their 2019 campaign. I haven’t seen bigger political idiots than this bunch of eternal fools. No wonder why I call them doorknobs. They in fact are worse. The last hope for them, the ‘Mahagathbandhan’, is in disarray even before it could start taking any kind of shape. The situation is even more precarious for the Congress party – who on earth in the ‘Mahagathbandhan’ would want to support RG as their leader after yesterday’s hara-kiri? As is nobody wants to be associated with serial losers. Even if ‘Mahagathbandhan’ takes any logical shape, though looks highly bleak now, no one of them would want Congress to even be a part in the coalition, much less allowing RG to be projected as the group’s PM candidate. The whole idea of showing opposition unity has backfired the worst possible way. More than the strength of the opposition, it is the BJP who emerged more forceful than what they were when they started in 2014. All this gimmick of ‘Modi Hatao’ vanished though thin air, much to the disappointment of all anti-Modi gang. The motion of trust also showed Shiv-Sena its place. In future I doubt if SS or Udhav Thakrey would be as mischievous as they were in the recent past. They won't because UT isn't as big a buffoon as RG is to not realize that they are nothing without BJP. All their existence is because of BJP only. It is they who are dependent on BJP than the other way round. One more nonsense and they may end up losing the filthy rich municipal body of Mumbai which they are ruling in alliance with BJP. I'm sure UT won't like the idea of giving away Mumbai municipal corporation for fun. Most of Congress’s Maharashtra politics of recent times was based on the cranky nature of SS. Now that window too seems to have been shut brutally on their faces. It is now perfect time for BJP to start preparing for the next general elections. They have readily available agenda and slogans to go about. I won’t mind or won’t be surprised if BJP calls for an early election. The opposition is in complete mess and nothing can fit better than what it is today for BJP to draw the last nails on the opposition coffin. As for Rahul Gandhi – he always would be worthless for me. Let him be happy with his bunch of sycophants and Pidis, who anyway are busy churning out editorials on how Rahul Gandhi has come of age, similarly how he came of age during 2010 too. Let RG get evolved by Nidhi Razdan for eternity.